Mine is little different from your's. I love the taste of this salad,specially in Summer.Looks so good tbc,white dishes are the hardest to photograph for me!I will post mine later sometimes. Thanks for your comment.. it led me to your blog. Lovely pics you have here. 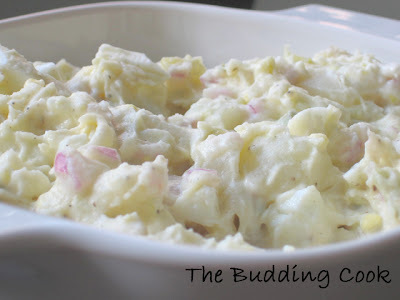 This potato salad looks nice and creamy. hmmm, that looks so creamy and yummy! great one to try out. you have some neat recipes and pics here. am adding you to the blogroll. Thanks for visiting my blog TBC. You doesnt seem to be a budding cook rather an expert. You have a nice set of recipes. Salad looks yummy. I stay far from Mayonnaise , will give a try without that. regarding the Pineapple malpua, you can use the regular whole milk. for measurements see the link I have given in my blog to Sandeepa's malpua. she has used milk. do let me know how it turned out to be. You have a wonderful collection of recipes. My first time here. will be back soon. This is somewhat like the russian salad. Corn salad looks very colorful. Lovely pictures too! How do you know whenever there is a new post? You are almost always the first one on all blogs that I visit! Please share your secret. Do post your recipe when you get a chance.I would like to try something new. I have a problem photographing all my dishes.. white or not! !I take almost 10-12 pics before I finally pick 1 or 2 to put up here. I never realized that blogging was so much work !!!.... & so much fun too!! Laavanya, thanks for the kind words!Hope to see you around here! Thanks for stopping by.Do try it out & let me know. Welcome! Thanks for the compliment. Thank you for adding me to your blogroll. It means a lot to me! That is very kind of you.Most of them ( the Indian ones) are my mom's recipes. I never set foot in a kitchen till I got married! I don't know if the salad would taste good without the mayo. Maybe you could try something & let me know too? The corn salad can be put together in minutes, do try it!